You can use your mobile device to add pictures to your PowerPoint presentation, Word document, or Excel workbook. Additionally, on an iPad or iPhone you can add a video to a PowerPoint presentation. This procedure requires iOS 12 on your mobile device and macOS Mojave on your Mac. Sign in to the same Apple ID on both your Mac and iOS device. Ensure that Wi-Fi is enabled on both devices. Ensure that Bluetooth is also enabled on both devices. Open an editable document on your Mac in PowerPoint or Word. Select where you want to insert the photo by right-clicking or control-clicking in the document. Under the name of the iOS device you'll use to take the photo, select Take Photo. On your iOS device, the camera app opens. Take a photo with it. After a moment, the photo is inserted in the document on your Mac. 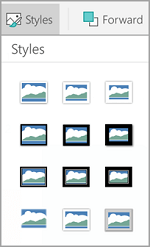 You may now style, move, or resize it in any way you like. For related guidance, see Use Continuity Camera on your Mac. Open your presentation, document, or workbook. Tap the location where you want to add the picture. On your Android tablet, tap Insert. On your Android phone, tap the Edit icon , tap Home, and then tap Insert. On the Insert tab, tap Pictures, and then tap Photos. If you're using Excel, tap Insert, and then tap Photos. Navigate to the location of the picture, and tap it to insert it. The Picture tab will appear. Use the following features on the Pictures tab to format your picture. 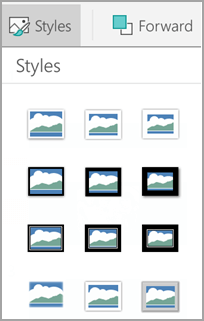 Styles – Select from a gallery of styles to add borders or change the shape of your picture. 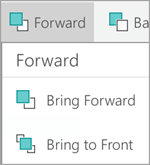 Forward – When you add pictures or other images, they are stacked in individual layers in the order you added them. Click Arrange and use the Bring Forward option to move the picture forward one layer or to move it to the top of the stack. 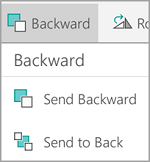 Backward – Click Arrange and use the SendBackward option to move the picture back one layer or to move it to the bottom of the stack. 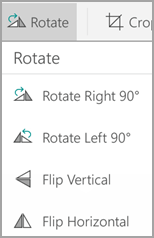 Rotate – Click Arrange and use the Rotate options to rotate or flip the picture. Note that you can also use the handle to rotate the image. Note: To see the Forward, Backward, Rotate, and Flip options on your Android phone, tap Arrange. 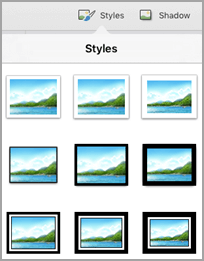 Crop – Use the CropPicture option and the handles to remove unwanted portions of your picture. Reset – Use Reset > Reset Picture to discard the formatting changes that you applied to a picture. 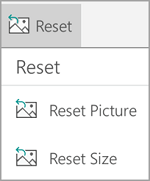 Use Reset > Reset Size to discard any changes that your made to the size of the picture. On the Insert tab, tap Pictures, and then tap Camera. If you're using Excel, tap Insert, and then tap Camera. Tap the control icon to see the camera options. You can change the exposure, set a timer, change the size, change to landscape mode, or switch the camera from back to front. After you have configured your picture, tap the camera button to take the picture and add it to your slide, document, or workbook. To discard the photo, tap the X. Note: The insert video option isn't available yet for PowerPoint on Android devices, and is not available in Word or Excel. However, if a video was added with another version of Office, you can play it on your Android device. 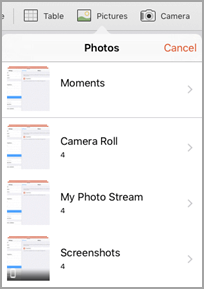 Before you can add pictures or videos, they must be stored on your iPad or iPhone and you must give your Office apps access to them. Slide the control for each Office app to give that app access. On your iPad, tap Insert. On your iPhone, tap the Edit icon , tap Home, and then tap Insert. On the Insert tab, tap Pictures, and then navigate to the location of your picture. Tap the picture to add it. Use the following features on the Picture tab to format your picture. Shadow – Select from a gallery of shading effects. 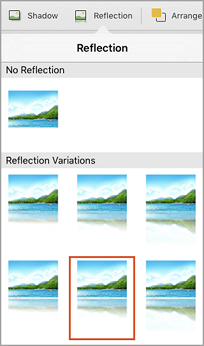 Reflection – Select from a gallery of mirror effects. Arrange – When you add pictures or other images, they are stacked in individual layers in the order you added them. Use the Arrange options to move the picture forward one layer, move it to the top of the stack, move the picture back one layer, or move it to the bottom of the stack. Crop – Use the Crop option to remove unwanted portions of your picture. 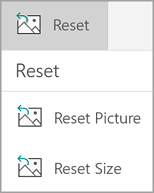 Reset – Use Reset > Reset Picture to discard the formatting changes that you applied to a picture. 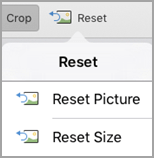 Use Reset > Reset Size to discard any changes that you made to the size of the picture. On the Insert tab, tap Camera. After you've take your picture, tap Use Photo add it to your slide, document, or workbook. To discard the photo, tap Retake and then Cancel. Before you can add a video to your presentation, it must be stored on your iPad or iPhone. Choose the slide that will contain the video. On the Insert tab, tap Videos and then navigate to the location of your video on your iPad. Tap the video to add it to your presentation. On your Windows tablet, tap Insert. On your Windows phone, double-tap the slide you want, then tap More at the bottom of your screen , tap Home, and then tap Insert. Navigate to the location of the picture, and tap it. On your Windows phone, tap the check mark. 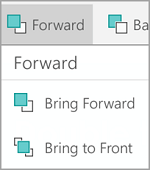 Forward – When you add pictures or other images, they are stacked in individual layers in the order you added them. Use the Forward option to move the picture forward one layer or to move it to the top of the stack. 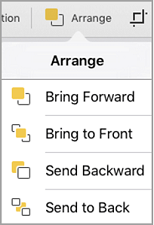 Backward – Use the Backward option to move the picture back one layer or to move it to the bottom of the stack. 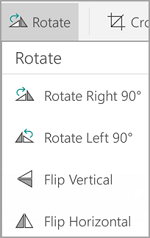 Rotate – Use the Rotate options to rotate or flip the picture. Note that you can also use the handle to rotate the image. Note: To see the Forward, Backward, and Rotate options on your Windows phone, tap Arrange. 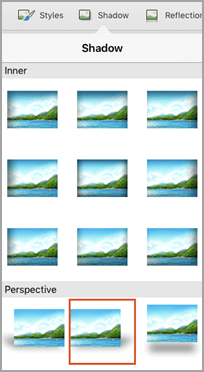 Crop – Use the Crop option to remove unwanted portions of your picture. Tap the down arrow to view the Crop menu. You can change the Picture Position and the Crop Position. Tap the Size icon to change the height and width of the picture. Tap Alt Text to add a title and description to the picture. On your Windows tablet, tap Insert. On your Windows phone, double-tap the slide you want, then tap More at the bottom of your screen , tap Home, and then tap Insert. (Optional) Tap the reverse camera icon to switch the camera focus from the back to the front. Tap the camera icon to take the picture. The photo will appear on your screen. To resize the picture, tap the Aspect Ratio icon . To insert the photo in your slide, tap the check mark . To discard the photo, tap the X. Note: The insert video option isn't available yet for PowerPoint on Windows devices. However, if a video was added with another version of Office, you can play it on your Windows device.